Inward/Outward Photos From The Launch Of Obasanjo’s Presidential Library With Many Historic Materials and 42 Million Books!! 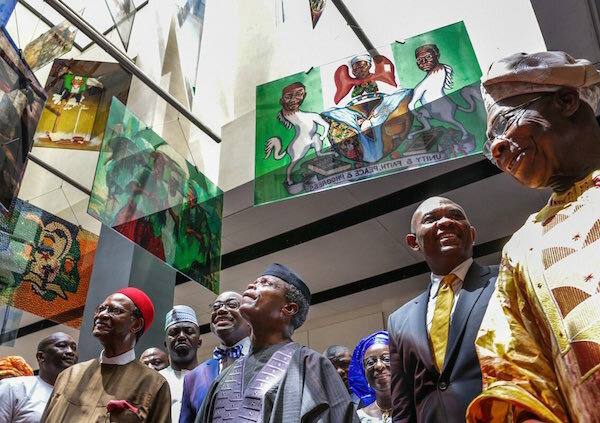 The Olusegun Obasanjo Presidential Library was officially opened on Saturday, in Abeokuta, the Ogun state capital, with 45 serving and ex-presidents over the globe in attendance. The library is a memorable, tourist and academic centre established as a national archive for preservation of documents and materials used by Obasanjo during his tenure as Nigeria’s President. The complex is probably the first of its kind in Africa, according to reports. The library houses over 42 million books, documents and archival materials including the former presidents primary school uniform, shoes, military uniform, his first car and other personal belongings. Established in 2005, the Olusegun Obasanjo Presidential Library was fashioned after the United States’ Presidential Library system and culture. It was launched as part of the programs to celebrate the 80th birthday of the two-time democratically elected President of Nigeria. The Library is expected to promote Nigeria on the world stage, and inspire other African nations in the advancement of democracy and preservation of the past for the future. See photos from the ceremony which is part of the events to mark Obasanjo’s 80th birthday celebration.